1.In large bowl, whisk oil, orange juice, soy sauce, chicken seasoning, ginger and red pepper until combined; reserve 1/4 cup marinade. Place chicken in large zip-top plastic bag. Pour remaining marinade over chicken; seal bag, pressing out excess air. Refrigerate 1 hour. 2.Cover half of outdoor grill rack with aluminum foil; poke several holes in foil. Prepare grill for direct grilling over medium-high heat. 3.In large bowl, toss mushrooms, onion, carrots and reserved 1/4 cup marinade. Place 18 x 24-inch sheet aluminum foil on work surface; place vegetable mixture in center. Bring top and bottom of foil sheet together over vegetables; crimp together and fold down over vegetables. Double fold both ends of packet toward vegetables. 4.Remove chicken from marinade; discard marinade. Place chicken on foil-covered grill rack; place vegetable packet on hot grill rack. Cover and cook chicken 8 minutes or until internal temperature reaches 165°F, stirring once; grill vegetables 15 minutes or until tender. 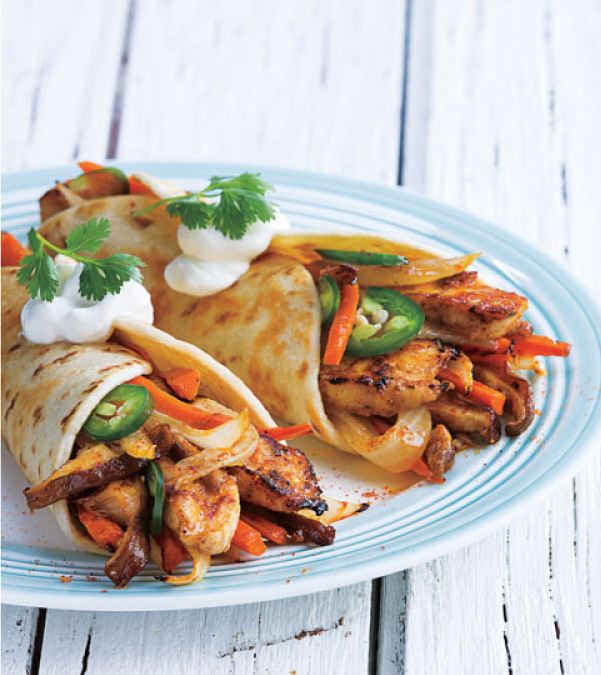 5.Fill tortillas with chicken and vegetables. > To warm tortillas: On microwave-safe plate, stack tortillas between 2 damp paper towels; heat in microwave oven on high 35 seconds or until warm. > Serve topped with sour cream, sliced fresh jalapeño peppers and fresh cilantro sprigs.